The April issue of Rolling Stone declared him as “Australia’s Most Important Voice.” Whilst this enormous accolade is accepted with great pride and humilty, it is the release of Gurrumul’s highly anticipated follow up album Rrakala that has media tongue’s wagging. This second solo album retains the quality, purity and sound of his first, but has this elusive artist delving into other genres and instruments within his own cultural context. Showcased for the first time are his exceptional skills on piano, drums, nylon string acoustic guitar, electric and acoustic guitars. This new release from Gurrumul is by far the most anticipated Australian release of the year. Rrakala will cement Gurrumul’s reputation and the extraordinary acheivement generated by the overwhelming reception that greeted his groundbreaking 2008 release, after making the cover of Australian Rolling Stone and bringing a truly independent recording (featuring songs in traditional language) to platinum status. Gurrumul has been able to move vast amounts of listeners worldwide and remain true to his artistic soul. Once again, that incredibly moving voice wraps itself around some deeply felt lyrics concerned with community and the natural world and spirit world. 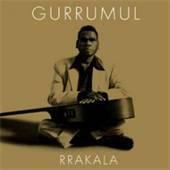 On Rrakala, Gurrumul has cast his net a little wider to take in some extra stylistic instrumental textures, with his multi-instrumental talents adding drums and piano and overdubbing harmonies. Paul Barr is from Readings Carlton.